Edit: Someone who goes by W9EO has recorded assembly videos on YouTube which you may find helpful for building this card. He is also selling completed cards if you don’t want to solder it yourself. Growing up, I used to play some games on an AST 286 computer, including Commander Keen, Wing Commander, and a few others. Sound in those days was primitive compared to modern machines, but I still have a soft spot for the bleeps and bloops of the OPL2 synthesizer cards (which includes the AdLib). Recently I have been fixing up an IBM XT (with original CGA card!) and I needed a sound card. 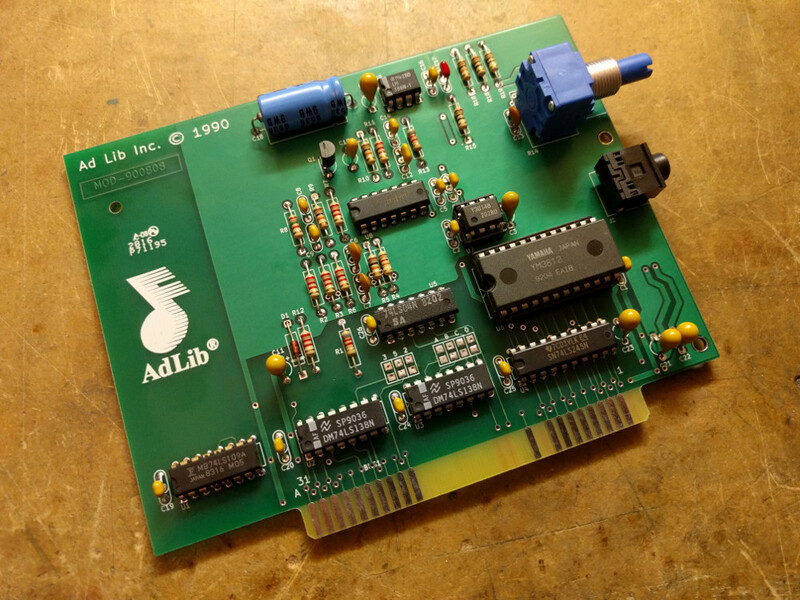 It turns out that early sound cards like the AdLib or the Sound Blaster are quite expensive on the used market, so I thought I’d make a clone of the AdLib sound card (1990 version). Being me, I couldn’t just make an electrical equivalent. It had to look as close as possible to the real thing. Compare it with the original 1990 version of the AdLib sound card. I started with Sergey’s OPL2 card and corrected some differences between it and the genuine AdLib card. Since I don’t own a physical card, I found photos on the net of the front and back of the card to use as a reference. To make sure everything matched up exactly, I figured out the design grid of the original and duplicated the traces and component placement as closely as possible. All the library footprints are custom designed to match! The KiCad design files are available on GitHub. Mouser part numbers are embedded in the KiCad design but they are also included in the table below. The Yamaha OPL2 chipset, the YM3812 and YM3014B pair, can be found at various sources online. They were socketed on many older Sound Blaster cards, so I suspect quite a few were recovered by the scrappers. To install the card in a computer, you’ll need to get a Keystone 9202 bracket. The KiCad layout includes a drawing showing where the holes need to be punched in the bracket. I recommend using a hand-held sheet metal punch with a 7mm or 9/32 die. You could also drill it but the punch makes a much cleaner hole. 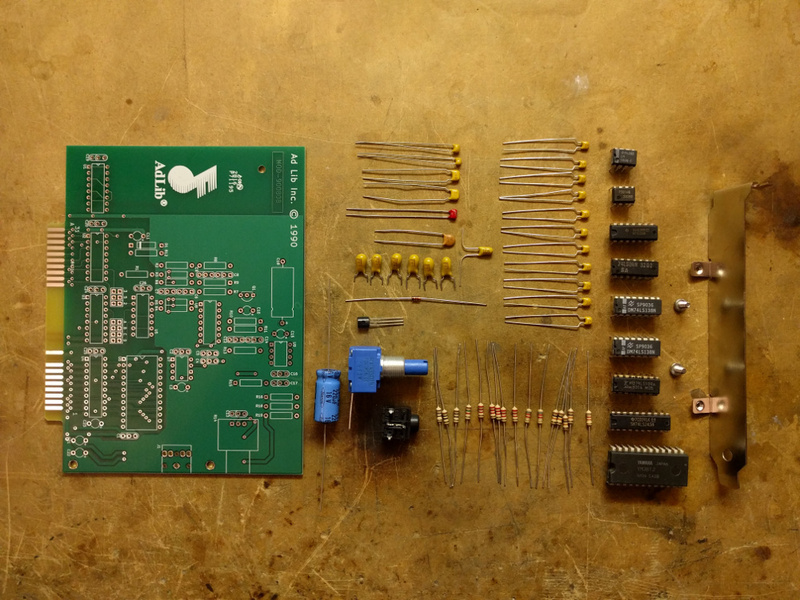 Here’s a bonus photo showing all the parts laid out before soldering. The components were chosen to match the colors on the original card. With a world wide market of… several! I need a 486 DOS6 machine to play Duke Nukem Plutonium Pack. I miss duke saying, “What are you waiting for? Christmas?”. Thanks for the nostalgia, Eric. Wow … this is bad, I can already see this card being sold as the real thing – being sold at 500% the material costs by scalpers. Sorry, but this does more harm than it helps if it’s not properly marked as a replica (little details being off [placement of the copyright notice, slightly different silkscreen] just won’t cut it). Yeah I went back and forth on this one, especially since the design files are available for anyone to modify. Adding “replica” on the silkscreen is just too easy for someone to remove, either from the design files or the Gerbers. I know it’s harder to see, but subtler differences are probably the most effective. Let me know if you have any ideas about a better solution. That was an amazing job! Where did you get your pcb made? Hey I’m really excited about this project and I don’t quite know my way around kicad. Is there any way I can get a Part List? I’ve updated the post to include the bill of materials. No kit, unfortunately. It should be simple enough to send out for boards given the files I’ve provided. Is it possible to obtain a raw Adlib-platine from you? Maybe three pieces? Love the project! My boards are on their way from Aisler. One question: what are the empty pads A-D and 3,5,2 for? They are for I/O address and IRQ jumpers which were never used. 3,5,2 correspond with IRQ 3, IRQ 5, and IRQ 2. IIRC only the internal OPL2 timers used the IRQ line, but the stock card doesn’t connect any of them. 0x388 is hardwired with a trace, and that’s what most Adlib support is written for. Thanks you very much Eric!